Clear all jellies and reach 138,000 points to complete the level. This level has hard difficulty. For this level try to play near to candies where you can play and as you have more candies available to play then make special candy. 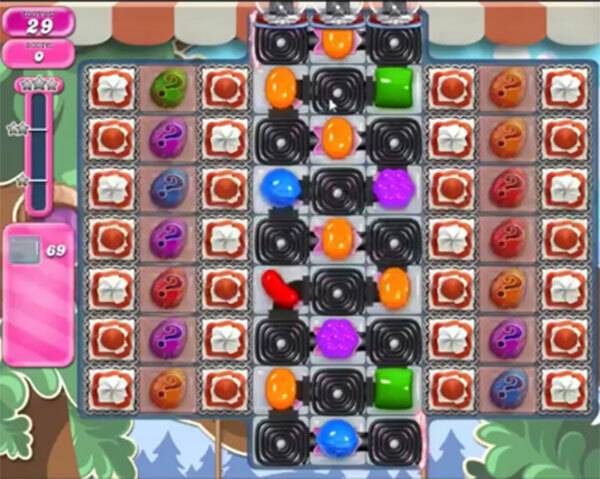 Or try to play more from one side have more candies and you can combine more same color candies. Use special candies or play with remaining jelly candy to break them all. Or watch video from below to get more help. I agree. This level was cut from 39 to 24 and it cannot be done in 24 moves. King stop this torturing of your customers so they will buy more moves or boosters. Games are suppose to be fun!!! On PC 24 moves only as well. So frustrating. I have only 24 moves,is that a mistake? Thank- you for looking into it.Appreciate it. 1685 completed! 5 boards! Watch video. 1685 tricky level took about 30 attempts make as many special candies and work from bottom of board ….